However you may feel about Lean In (Facebook COO Sheryl Sandberg’s TEDtalk that became a book that became a movement), it certainly has been successful in revitalizing dialogue about women in business. From MacLeans to The Economist, it seems that just about every major business journal has chimed in on the discussion since the book’s release earlier this year. But where does one begin in empowering young women to aim high in future careers? Good news: if you’re an SMS family you’ve already made some strong choices in selecting an all-girl campus. Even better news: following a successful pilot, this coming school year a new course will be dedicated to developing business acumen by exposing students to the fundamentals of investment featuring real-world case studies and guest speakers from our local experts & entrepreneurs. The students in Mrs. Lisa Reid’s class have had a diverse group of interesting guests come to speak on varying topics the group has been exposed to this term. In addition, the students went on a field trip to local company Viberg Boots, which was recently featured on an episode of The Big Decision with venture capitalist Arlene Dickinson. St. Margaret’s own Ms. Sonam Dema was their first guest speaker. Ms. Dema, who is from the Himalayan gem, Bhutan, explained the principles of her country’s “Gross National Happiness” framework, which is a repurposing of one of our society’s financial measurements, Gross Domestic Product (GDP). The girls were enthralled to hear all about the specifics of the platform and asked many other questions about Bhutan, the world’s newest democratic country. Understandably, the students were also transfixed by Ms. Dema’s stories of having attended high school with the King of Bhutan! Their next guest speaker was Ms. Bonnie Manning, a financial planner and investment advisor from National Bank of Canada. It was beneficial for the students to hear what exactly Ms. Manning does in her role as a financial planner and advisor. Students also had an opportunity to look at an actual investment portfolio and to reflect how the timing of the purchases and the investment mix came into play, factors they have also been learning about in class. To supplement their last unit on entrepreneurship, Mr. Dave Secco visited the class to share his reflections on this growing area. Having started “Zuppa to Go,” Mr. Secco explained that he was able to parlay his passion for cooking into a successful part-time business. In fact, Mr. Secco related that he has had other entrepreneurial roles since graduating from university and that most of these ventures have sprung from what has “jazzed” him. He also stressed that mentorship is paramount along with good old-fashioned hard work and determination. 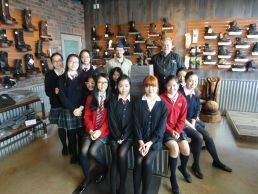 Lastly, a whirlwind outing to Viberg Boots, a boot manufacturing business established in 1931, was an opportunity for students to see the real faces behind the ones featured on the CBC’s The Big Decision. Second and third-generation operators respectively, Mr. Glen Viberg and Mr. Brett Viberg were on hand to give students an overview of the company’s history, which was rooted in work boots, and its present ventures into the international fashion-footwear industry. Before touring the factory, Mr. Glen Viberg recounted one of the first times he realized the significance of the Viberg name in Asia, explaining that while he was in Japan a customer asked if he could autograph her boot box. Mr. Brett Viberg also put the company’s growing new path into perspective by telling the girls he has flown over 35,000 miles since this January, and that he is looking forward to opening a “pop-up” store in New York City. Students should watch for Introduction to Investment 11 when making course selections for 2013/2014. And the world better watch out for SMS grads, because these girls are ready to lean in.